More friends and a blog: Just a tomato? I showed the boys this tomato that I picked this morning. W immediately began singing this tune. Aaaargh!! We only just got it out of our heads from when we heard it last time. E chimed in for the Ron Weasley part. ;-) At any rate, I think he might have a point. 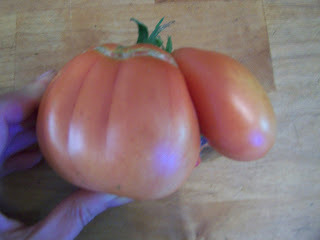 This tomato is rather Snape-ish. Speaking of which is any one else as sad as I am that the next movie has been postponed? I keep hoping it is just some ploy/hype to get people revved up about it and that it really will still come out in November but things are not looking good. Sigh. Now I'm convinced that your love of Rickman is incurable. You're seeing his face in a tomato!